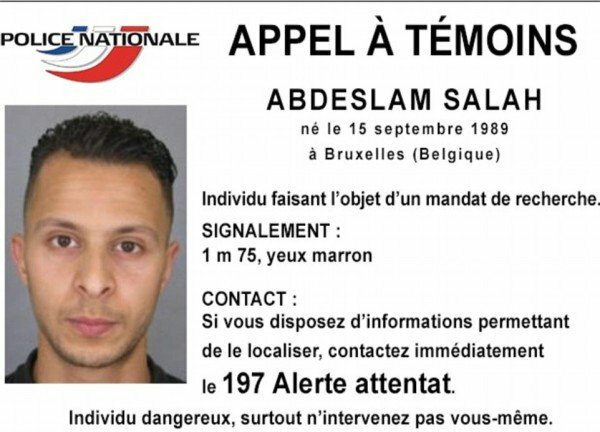 French citizen Salah Abdeslam is wanted in connection with the attacks in Paris that left 129 people dead on November 13. Police have issued a photograph of Salah Abdeslam, 26, is describing him as dangerous. Seven attackers, two of whom had lived in Belgium, died during a series of assaults in Paris, officials said. On November 15, French aircraft struck the ISIS stronghold of Raqqa in Syria, hitting four targets, France’s defense ministry said. President Francois Hollande had described the attacks in Paris as an act of war – and promised that France’s reaction would be pitiless. French Interior Minister Bernard Cazeneuve said the attacks had been prepared “by a group of individuals based in Belgium” who had “benefited from accomplices in France”. The attackers targeted restaurants, a concert hall and the Stade de France, the country’s main sports stadium. Paris hospitals have said the official number of dead – not including attackers – remains at 129 people. Meanwhile panic broke out at the Place de la Republique, where hundreds of people had gathered to honor the victims. Crowds ran over flowers and candles. Police – who cleared the square – later said people may have mistaken the sound of firecrackers for gunfire. On November 15, the discovery of a suspected getaway car in Montreuil, east of Paris, fuelled suspicion that at least one suspect had escaped. French police appealed for information about Salah Abdelslam but warned people not to approach him. Unnamed officials said he was one of three brothers linked to the attack. The Seat car found in Montreuil is believed to have been used by gunmen who opened fire on people in restaurants on November 13, police say. A number of AK47 rifles were found in the car, French media quote judicial sources as saying. The Seat and a VW Polo used by the attackers were rented in Belgium. The Polo was found near the Bataclan concert venue, where 89 people were killed. One of the Paris attackers lived in Brussels and another in the nearby town of Molenbeek, Belgian prosecutors said on Sunday, without naming either. A total of seven men had been arrested in Molenbeek, they added. Not all are being held in direct connection with the Paris attacks. A brother of Salah Abdelslam was said to be among them, while another brother is reported to be one of the seven dead attackers. The only dead attacker to be named so far is a 29-year-old Frenchman, Ismail Omar Mostefai. Ismail Omar Mostefai had a criminal record and had been flagged up as a possible Islamist extremist by French intelligence.